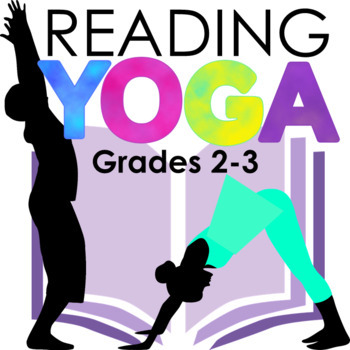 My Literary Yoga lesson for secondary students has been such a hit in my classroom as well as others that I decided to modify it in order to bring some yoga love to the younger grades as well! 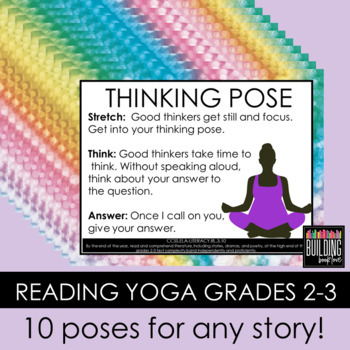 12 brightly designed full-page posters of these same tasks to post in centers or use as paper free tasks on devices. 1 Link to a prezi for an easy whole class instruction guide. Please see my preview to determine if these tasks are the correct level for your students! 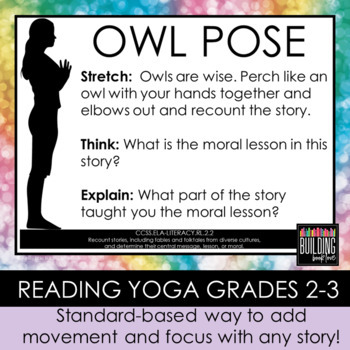 ****Note****The poses in this lesson are easy enough (or can be modified enough) that most all students and teachers will be able to participate. However, this lesson DOES require that teachers have a certain personality. 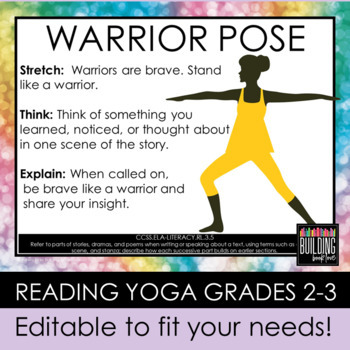 Don't be afraid to laugh through some of these poses with your students when you need a light-hearted moment. Or, turn on some yoga music (there's a Pandora station for this!) and lower the lights for a more serious think time. Want to earn credits to use on future TPT purchases from ANY store??? Simply go to "My Purchases" and review your items. Feedback is greatly appreciated! If you have any questions or need changes on a document, please contact me via the Q&A tab on this lesson. Be sure to follow me for updates on new creative lessons I post!